The team pays courtesy call to Ambassador Philippe Lhuillier during their visit to Madrid. Out of 22 competing films among selected entries to the festival’s Official Selection, Director Brillante Mendoza’s “Alpha, The Right to Kill” won the Special Jury Prize of the 66th San Sebastian International Film Festival during the awards night on 27 September 2018 in San Sebastian, Spain. The 94-minute movie features actors Allen Dizon, Elijah Filamor and Baron Geisler and is set against the backdrop on the government’s crackdown on illegal drugs. In his remarks, cinema producer Mr. Carlo Valenzona dedicates the award to all Filipinos in the world, after receiving the trophy for the Special Jury Prize given to Director Brillante Mendoza´s film. The award is just the latest in Director Mendoza’s list of accolades. Some of his most notable accomplishments include winning the Golden Leopard in Locarno with his first film, Masahista (2005), Servis at the Cannes Festival, where he later on also won the Best Director Award for Kinatay (2009). At the Venice Film Festival, he competed with Lola (2009) and Thy Womb (2012), and in Berlin with Captive (2012). Also at Cannes, he participated in the Un Certain Regard category with Taklub (2015) and Ma’ Rosa (2016) received the Best Actress Award at the same festival. He was producer of Daniel Palacios’ film Pailalim (Underground), which was the Philippines’ entry in the New Directors category at San Sebastian in 2017. Philippine Honorary Consul in Bilbao Ms. Susana Bilbao (far right). 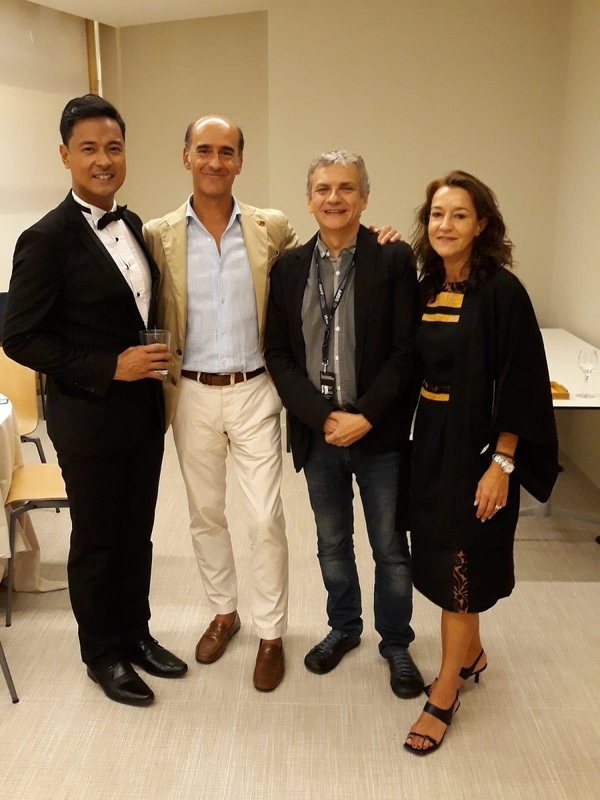 This year’s winner for the Golden Shell for Best Film was awarded to Entre Dos Aguas (Between Two Waters) by Spanish Director Isaki Lacuesta, followed by the Special Jury Prize for the Philippine entry. Donostia awards were also given to Japanese director Hirokazu Koreeda, Mr. Danny DeVito and Ms. Judi Dench, in recognition of their outstanding contributions to the film industry. The company organizer for the event, Festival Internacional de Cine de Donostia-San Sebastian, is composed of the City Council of Donostia-San Sebastian, the Basque Government, the Gipuzkoa Regional Government and the Spanish Ministry of Culture.